I offered this pattern for sale last year before Easter through a LYS, and it did fairly well. It's one of my favorite, huggable patterns, and I hope you enjoy it, too! Rnd 7: work even, no inc or dec. (8 sc) ss in next st, and fasten off, leaving a long tail for closing and sewing. Rnd 3 - 4: work even, no inc or dec (12 sc) At the end of round 4, ss in next st, and fasten off, leaving a long tail for closing and sewing. Rnd 1: 4 sc in a magic ring. Rnd 4: *2 sc (inc) in next sc, sc in next sc; repeat from * around (6 sc). Rnds 5 and 6: work even, no inc or dec (6 sc). I find it easiest to pin my parts in place before sewing them to assure proper placement. Beginning with the head, place or sew nose in the center of the 5th or sixth round. Place or sew the eyes in the round above the nose, one or two spaces away from the nose. Stuff. Stuff body firmly, and attach to the head. Stuff feet, and weave yarn tail through the last row of stitches, pull to gather closed. Sew to the bottom of the body in the second or third round. Weave yarn through the last row of stitches, but do NOT pull to gather closed. Stuff the tail, and holding the stuffing in the tail with a finger, pull the yarn tail to gather the opening closed. 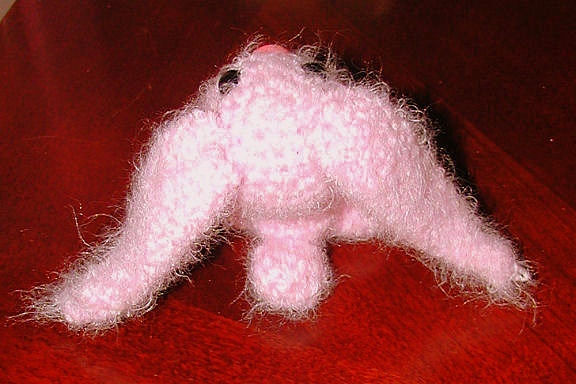 Put a stitch or two into plac to hold the tail closed, then sew to the back of the bunny, approximately in the third round, where ever it will balance the bunny correctly. Do not stuff arms.Sew arms to the sides of the body, in rounds 5 - 8. Run one tail through the center of one arm and out of the other to draw them together. sew a few stritches to the back to anchor. Do not stuff ears. Weave yarn tail through the last row of stitches, and gather slightly, then sew to the top of the head in round 2 or three. Yes! 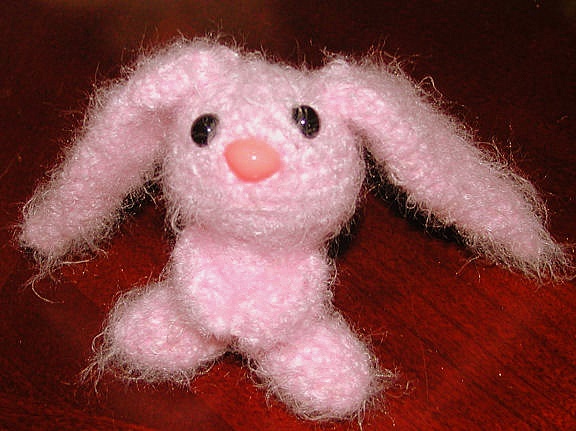 The type of amigurumi bunny pattern I've been looking for!Thanks for the pattern.